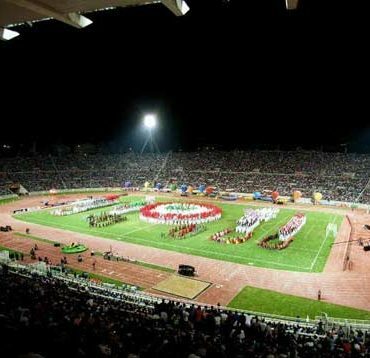 -The Eighth Pan Arab Games were inaugurated Saturday by president Elias Hrawi, who said “From the Camille Chamoun Sports City, I declare the Pan Arab Games open”. -Spectators who were barred from entering the stadium because of over-capacity were pushed back by security provoking scuffles. At 6.30 p.m, the stadium was already packed. Its seating capacity is 50,000 and tickets distributed exceeded 150,000. -Crowds lucky to have seats inside the stadium cheered warmly the Arab teams, as they filed one after another past the VIP section. Only 19 Arab member attended with Iraq, Somalia and Comoros not participating. -Hundreds of youngsters dressed in purple and orange costumes performed traditional Lebanese dances. Huge fireworks ended the ceremony. -21 sporting events are scheduled but four were canceled for lack of players. 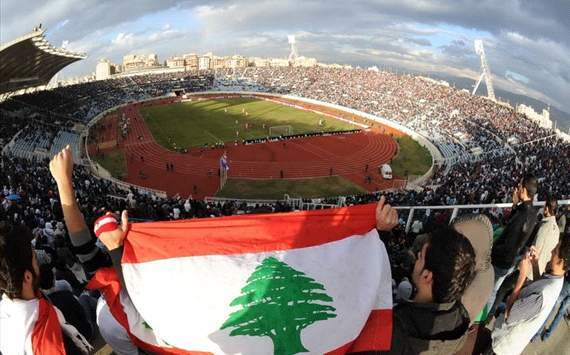 -President Hrawi in his opening speech said Lebanon would do all it could to make the games a success. “From Lebanon we say to the world; The Lebanese have returned to their heritage and unity, they have returned to build a Lebanon for heroes, youth and peace”. He thanked Kuwait and Saudi Arabia for financing the construction of the Sports City. He also expressed gratitude to the efforts deployed by premier Hariri for supervising the construction. -Prime minister Rafic Hariri said in his speech The opening ceremony marked the day when “Construction won over destruction, and peace over war” and “Every stone built in this place is a victory for the martyrs who died during the war”. 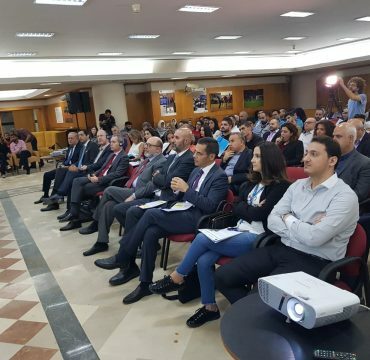 Hariri added saying “Israel transformed this place into a graveyard but it has become a place for unity, peace and Arab solidarity under president Elias Hrawi’s mandate”. -President of the Pan Arab Games Association prince Faisal bin Fahd bin Abdel Aziz said “This is a tournament of solidarity between the Lebanese people who have established credibility in their country and given rise to this great sporting event”. “Bombs can destroy a city but can never shake the faith of believers”, he said. -Secretary general of the Arab League applauded Lebanon for accepting the challenge to host the event and “those who doubted Lebanon’s capabilities to organize the event were not aware of its deep-rooted strength or its cultural and educational heritage”. -Lebanon foreign minister said Sunday “Lebanon was left in a difficult position, inviting Iraq and losing the participation of countries whose relations with Lebanon are of paramount importance, or excluding Iraq to safeguard relative inter-Arab accord, because full accord was not possible”. Boueiz , who was commenting on the exclusion of Iraq, was the first official to admit that Iraq had not been invited because its arch rivals Kuwait and Saudi Arabia had threatened to walk out. Boueiz added ” There is no secret that, even in sports, the repercussions of the Gulf war can still be felt”. -The Iraqi athletes, trapped at the Lebanese border point Masnaa, and in an attempt to express their stand carried banners which read “Saddam Hussein’s athletes are the first to call for Arab solidarity”, and “Yes, to sports that unite people and no to sports that separates the Arabs”. Head of the Iraqi team Assil Tabra said “The athletes endured a hard trip by land in order to participate in the games and it was a sign that they held a deep respect for Arab nationalism”. -Secretary General of the Arab League Issmat abdel Maguid declared that banning Iraq from participation in the games was painful, but the “least harmful had to be chosen”. He said “This issue could have been solved last April when Lebanon answered and Arab League request and sent invitations to all Arab countries, which was a normal thing to do”. -President of the International Olympic Committee, Juan Antonio Samaranch, reflected that keeping sports out of politics was not an easy task. “It is very easy to say that sports has nothing to do with politics, but you can find politics everywhere” and “This problem is solved bit by bit, step by step,, I am sure it will be solved”. -The Iraqi most influential daily Babil said “Lebanon had prevented the athletes from entering for silly financial profits”. -Algerian woman runner Dalila Meyale won the first gold medal of the Eighth Arab Games yesterday clocking 1:26:41 in the 21 km half marathon that started at the Sports City and ended same place after running throughout Beirut streets. The second gold medal was for the Tunisian runner Attaher Mansour in the 42.195 km men’s marathon race with a time of 2:28:19. He was the first to win this race in two consecutive Arab games.